You can spot a cavalcade of boxy Cadillacs lining the curb, and the street sign says 14th Street NW. But this isn't actually D.C's famous strip in the 1970s. WASHINGTON — You can spot a cavalcade of boxy Cadillacs lining the curb, and the street sign says 14th Street NW. But this isn’t actually D.C.’s famous strip in the 1970s. 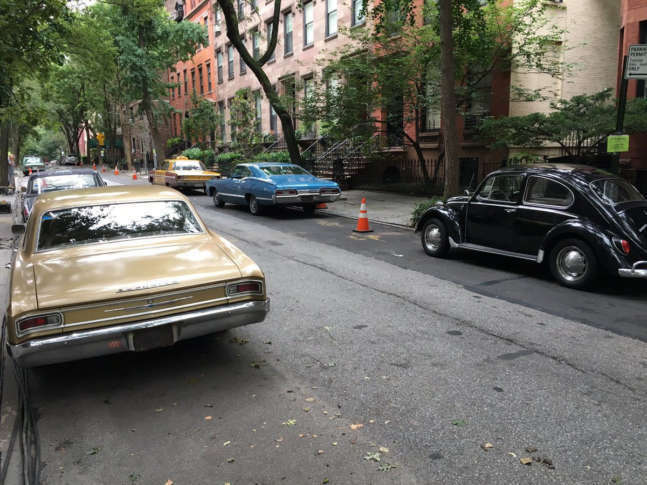 It’s a New York City neighborhood temporarily sent through the time machine for an upcoming Steven Spielberg-directed movie. The film “Nor’easter” is set to star Tom Hanks and Meryl Streep as legendary Washington Post editor Ben Bradlee and publisher Katherine Graham during the time the paper challenged the U.S. government for the right to publish the politically explosive Pentagon Papers in 1971. Filming Tuesday took place in the upscale Brooklyn Heights neighborhood. Twitter user and neighborhood resident Jason Rabinowitz captured crew members preparing the street for shooting, even snapping a picture of one member of the crew hanging a green D.C. street sign up at the corner. Additional filming is set to take place in D.C. A notice put out by SAG-AFTRA sought background performers and their pre-1971 automobiles for filming to take place in D.C. Thursday and Friday. Of course, Spielberg’s team will probably work wonders in postproduction, but it’s worth noting 14th Street was a lot seedier than the tony neighborhood in which Tuesday’s filming took place.